How to Save on Emergency Supplies – Disaster Prep on a Budget - BugOut MAG! House fires are hands-down the disaster any of us are most likely to face. 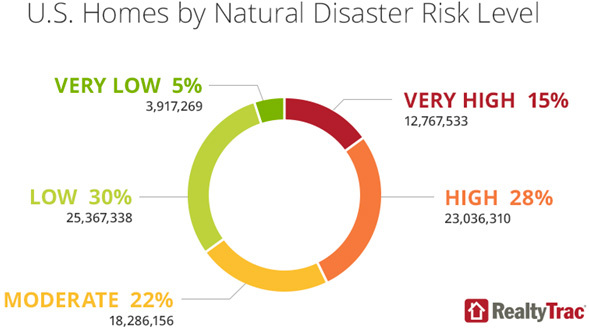 More Americans die each year, as a result of fire, than from all natural disasters combined. According to statistics from the National Fire Protection Association (NFPA), your chances of experiencing a reportable house fire during your lifetime is one in four. Though the risk does vary by location (see the chart above), house fires kill more Americans each year than all natural disasters combined. 3,428 lives were claimed by fire in 2014. Wildfire, floods, winter storms, wind storms, tsunamis, earthquakes, volcanos – all pose different problems and require specific preparations. We won’t attempt to go deeply into the variables here. Rather, we’ll provide direct references to the information you’ll need to get aware and get prepared. Hazards vary by location. 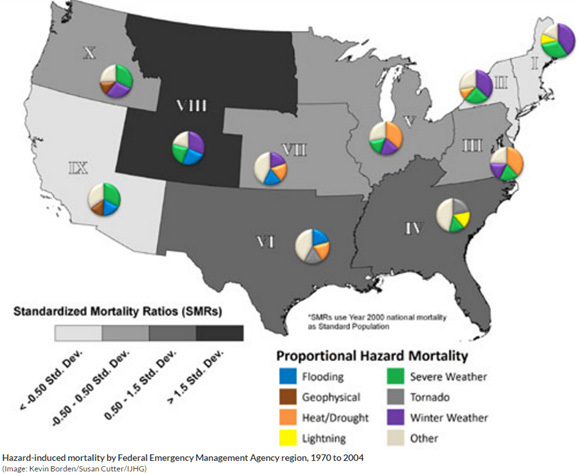 The map below is based on mortality rates due to natural disasters over a 30+ year period. The Red Cross suggests a “hazard hunt” in and around your home. If you use natural gas, do you know how to shut off the gas? Do you know where the water and electrical shut-offs are? Are there rickety steps, frayed wires, or overloaded outlets? Take a walk around your property with an eye towards hazard identification. While you’re on the hazard hunt, remember to also look for hazard abatements. Where are your smoke, heat, and CO2 detectors? Are they operating properly, and are the batteries being replaced regularly? Do you have fire extinguishers? Where are they, and are they properly pressurized? Where are water outlets and hoses? Where are emergency flashlights and batteries? To be prepared, you not only need to make sure you have the necessary tools, but you must know where they are and be able to access them quickly. Do you know how to shut down the supply? Do you know where the water and electrical shut-offs are? Are there rickety steps, frayed wires, or overloaded outlets? Where are your smoke, heat, and CO2 detectors? Are they operating properly, and are the batteries being replaced regularly? Do you have fire extinguishers? Where are they, and are they properly pressurized? Where are water outlets and hoses? Where are emergency flashlights and batteries? FEMA’s Emergency Alert System (EAS) is an integrated network meant “to provide the President the capability to address the American people within 10 minutes during a national emergency.” Anyone watching television or listening to a radio station will receive those messages automatically. For mobile devices, the Wireless Emergency Alerts (WES) system provides similar notifications. To find out more about the technology and how to tell whether your phone is WES ready, go to the NOAA website, Weather Ready Nation. You should also subscribe voluntarily to emergency broadcast systems. From news about severe weather conditions near you to law enforcement announcements, those channels give you an early heads-up about things you might later hear covered in scheduled news broadcasts. American Red Cross: This is our favorite site for emergency preparation. Go there for training, get the Red Cross notification apps, sign up for news… but don’t leave until you’ve begun the process of becoming an American Red Cross volunteer. Make a difference for others while you learn. The Red Cross offers several smartphone apps to help keep you informed about hazardous conditions of all kinds. National Weather Service Alerts: There’s a ton of information on the National Weather Service (NWS) website. You can drill down to the specific county or region, and you can install an app on your smartphone to get mobile notifications. Here in the Internet Age, it’s not unusual to hear breaking news on Twitter or Facebook before it gets broadcast on traditional news channels. Early notifications can certainly help you avoid traffic jams and get ready quicker to face an oncoming emergency, but be sure to verify what you’re hearing online with official channels. Ready.gov: This is the national clearinghouse for public safety. Find out about wireless emergency alerts, the emergency alert system, NOAA weather radio, and more. Although much of the information here is duplicated on the previously mentioned Weather.gov site, Ready.gov is a prime spot for getting information on how to deal with emergencies. Alternative alert platforms are available for specific regions, for boats and ships, for those who are deaf or hard of hearing, for those near specific potential hazards (tsunami risk areas, for instance), and more. The weather.gov website offers an expanded list of options. Advisory: Hazardous conditions are expected and may be hazardous. While there could be considerable inconvenience, conditions should not be life-threatening. Watch:: Hazardous conditions of significant proportion are possible. Get ready. Conditions could be severe. There is a possibility of electrical power loss and danger to life. Prepare and stay tuned to monitor the situation. Warning: A hazardous event is underway or about to begin. Take cover and stay alert. Problems occur when multiple advisories are issued over a period of time, but conditions don’t get too bad. When the advisory changes to a watch or warning (meaning the likelihood of occurrence is now considerably greater), people are often less prone to believe the prediction, thereby leaving themselves vulnerable to the hazard. By knowing what the terms mean, you’ll be in a better position to take appropriate action. It may sound like an out-of-order sequence for teaching someone how to deliver a speech, but the Talk, Plan, Practice model promoted by the Red Cross covers all the fundamentals of emergency preparedness. Let’s look at the components to see why. Not only does teamwork make the work lighter, but it helps you uncover unrecognized concerns and do a better job of advanced planning. Each person can share their personal concerns, ideas, and capabilities. One way to extend the zone of protection is to talk with neighbors. There could be someone who would need special assistance in the event of an emergency, another may have special equipment that could make hard work easier (a chainsaw, for instance), or there could be someone with medical or first responder training. Getting your neighbors involved in a community discussion about emergency preparedness will help expedite the teamwork process when it is needed. After all, you’d naturally come to the assistance of others in your neighborhood. Why not spearhead the effort to get organized before help is needed? For sure, you’ll want to talk with the people who live with you. From the youngest to the eldest, everyone should take part in the discussion. Make a list of the resources you have available. That list will be invaluable in the next step. You’ve already identified the risks, and you know how to monitor them. You’ve spoken with those most likely to face an emergency with you, and you’ve prepared a list of available resources/skills. That gives you the starting point for an informed emergency plan. You want to know who does what and how you will communicate during the event. Who does what and how will you stay in touch? If a storm watch is issued, will dad pick up the kids from school, while mom makes a final run to the grocery store? If home evacuation is necessary, which exit will each person use, and where will you meet as a team to be sure all are clear? Your plan will vary according to the hazard and your particular situation, so talking through each scenario and setting the plan down in writing will help clarify the responsibilities of each person. When the emergency is underway, it is critical that clear communications take place and everyone understands exactly what needs to be done and who is in charge of the task. Prepare a contact information card that includes the phone numbers of all group members and other contacts you may need (doctor, utilities, insurance info, etc. ), then laminate the cards and give one to every group member. Ready.gov provides in-depth coverage on how to prepare your emergency communications plan. You can even get downloadable templates to fill out and print. Remember: It’s often possible to send a text message via your cell phone, even when voice calls aren’t going through. You’ll want to identify a nearby emergency meeting place where head counts can take place, but you’ll also want to pre-plan an emergency check-in location further away from your home or business. You’ll also want to identify and enlist the help of a third-party who doesn’t live in your neighborhood and isn’t normally nearby. That will give your team a common check-in point in case you get separated. Be sure to coordinate with others. Get a copy of the emergency plan at the schools your children attend. If loved ones are in care facilities, get the plan and use it to inform your own plan. Choose someone out of state for your distant contact. In a disaster, it may be easier to make a long-distance call than it is to make a local call. Register on the Red Cross website that allows families or teams to confirm their situation. Here is the link for that communications tool: Safe and Well. Code emergency information on your phone by prefacing it with “ICE” (In case of emergency). That will make it easier to access. During disasters, landline telephones may still be in service after cellular service is unavailable. Make sure your phone is one that does not require electricity to operate. Check your insurance policies in advance to determine your coverage for the most likely events. You may need a separate policy to cover some types of disasters. Having the talk and preparing the plan are excellent ways to build confidence, but the real rewards come when you put the plan into action… with practice. Check second hand stores for an old-style landline rotary dial phone. They are rugged and require only an active telephone landline for operation. The current price on Amazon ranges from about $35 to $70. You’ll want a waterproof container for your important documents, but you don’t have to buy a special document box. Rather, you can enclose them in gallon-sized plastic bags, then place them inside a sealed plastic container. Both are inexpensive and available at any Big Lots or other discount store. It’s a good idea to laminate your emergency contact phone lists. Any office supply store will carry do-it-yourself lamination sheets or pouches that will do the job just fine. You could use freezer bags, but lamination is best. If “practice makes perfect,” then emergency preparedness is something you want to be an expert at. Your plan can be the difference between a catastrophe and an exciting story, or between life and death. Set the situation, then walk through the response. For instance, have your family members go to their bedrooms and imagine it’s two in the morning and the smoke detector suddenly goes off. We won’t cover individual responses to every possible disaster in this guide. Instead, we’ll point you to the Red Cross page that covers each in detail. We’ll assume you’ve identified the hazards and included them in your master plan. For instance: components for fire would include pre-planning escape routes, practicing low crawling in case of dense smoke, and knowing to stop/drop/roll if clothing ignites. The Red Cross suggests practicing earthquake and fire drills every six months at a minimum. That same twice-per-year schedule should include a full-scale evacuation of your home, along with your emergency gear and pets. Carrying out your plan can be a whole lot easier and more effective when you have the proper gear on hand – ready to use and in working order. Smoke detectors, for instance, need a source of power. The batteries should be tested regularly. And the grocery store may run out of supplies in short order during a disaster. You’ll need to stock up in advance to be prepared. Nine-volt batteries are fine for smoke detectors, but you’ll get more life from AA batteries to power your lights and lamps. Generic batteries and name-brand batteries perform and last about the same for general purpose usage. Find batteries on sale and buy in bulk. Store them at room temperature and humidity. Don’t freeze alkaline batteries. Alkaline batteries can typically last 10 years in storage. Check expiration dates on the package. Search Coupon Chief for deals on batteries and other emergency prep equipment. It’s true that you can cut open a nine-volt battery and retrieve six AA batteries from the case. That could be helpful information in an emergency, but it’s not a practice we recommend. Let’s move on to consider Red Cross recommendations for the types of kits you’ll need and the contents of each. Three things are essential: water, food, and first aid supplies. Water: The Red Cross recommendation is for one gallon per person, per day, for a minimum of three days. You should also have a plan for what you’ll do should the water supply run out. Food: You’ll want to store foods that don’t require refrigeration or cooking. Make sure there’s enough to feed everyone in the family for a minimum of three days. First Aid Kit: Bandages, antiseptics, first aid cremes, and the basic first aid supplies should be packaged together in one container. You should also be sure to keep an adequate supply of prescription drugs on hand. Don’t wait until the last day to refill. You’ll need to rotate your water supply every six months. You can begin by purchasing gallon jugs of distilled water every time you go to the grocery store. While not an ideal method, it’s a quick way to get your gallon per person per day backup started. You can use the water for cooking, refilling water bottles, making iced tea, and such – meaning you’ll have a constant flow of water going out and water coming in. That ensures rotation. The downside is this method can take up considerable space. Some grocery stores have water dispensing machines. Once you have a sufficient number of jugs, you can refill there to save money. Our local Whole Foods provides water refills for free. You can also check for natural springs near you and use those for refills. Check the Find a Spring website to see if that’s an option for you. The optimum storage container for water is a UV-resistant, food-grade plastic container. Look for plastics identified as #1, #2, or #4. Typically, containers made specifically for water are blue (helps keep the water free of bacteria). Clean water stored properly will never “go bad.” Prices vary considerably, so shop around. Check Craigslist or other local for sale sites. Check your local outdoor stores. The big box stores like Walmart, Costco, and Home Depot are also places to find affordable pricing. Your food emergency reserve can start with a 25-lb bag of dry beans and 12-lb bag of rice. Fill up a five-gallon plastic bucket (about 30 lbs) full of each and you’ll have enough food for one person to survive on for almost two months. For best results, make sure the food is sealed in plastic bags before placing in the bucket. Brown rice, because of the oils it contains, won’t keep as long as other varieties of rice. Costco and the other big box stores carry rice and beans in bulk at low prices. You’d probably get a little tired of rice and beans after a while, so start collecting canned goods on your trips to the grocery store. Get in the habit of buying extra cans of the foods you like most. Keep an eye out for sales and coupons – always an excellent way to save money. The big box stores carry foods in cases, but always compare prices. Everything that comes in a bigger package is not always less expensive. Be sure to check cans and discard or return any that are dented. You can purchase pre-packaged emergency food kits containing freeze-dried foods. A popular product on Amazon comes in a five-gallon bucket and contains a month’s supply of food for one person. The cost is $83.99. That can certainly be the easiest way to get your emergency food together, but it will cost more money and isn’t likely to be as tasty as the rice, beans, and canned foods you choose on our own. Ready-to-go first aid kits are a quick way to get started. We recommend getting one with a durable case (you probably already have one), then checking to be sure you have the items you need. Normally, for instance, you’ll want to add extra adhesive bandages. You’ll also want to check dates on the items that expire (aspirin, cold tablets, etc.) and make sure to rotate them. Choose your own terminology, but get this kit together first. You’ll want a larger, more substantial store of goods in case you need to hunker down at home, but your go-bag will be the first substantial evidence you’re serious about being prepared. To begin, you’ll need a bag. You may already have a backpack that would work. You want something tough and easy to carry. Much depends on how heavy you want the bag to be and how much you have to spend. We consider the items listed above to be essentials. All of this gear can get heavy. Ideally, you’ll want your bug out bag, when packed, to weigh no more than about ten percent of your body weight. You can purchase bags already loaded with gear. That’s quick and easy. However, you probably won’t get the best quality and durability.To get started, you can keep your list with you and purchase the items you need a little at a time. Of course, the sooner the better.Bag selection is critical. You want it to fit you well and be comfortable. It must also be extremely durable. You can shop for bags at your local sporting goods or military discount store. Once you know what you like and how it feels, you can compare prices online and check local second hand stores for a bargain find. For shelter and bedding, the top end is a lightweight tent and sleeping bag. To save expense, you can use a tarp for a makeshift shelter and a wool blanket or space blanket for bedding. Check backpacking supply stores for ideas. Self-defense equipment can range from a handgun to a bottle of pepper spray. Choose whatever makes you feel most comfortable, but you will want to be prepared to defend yourself against attacks from both animals and humans. Satellite phones are more dependable during an emergency, but also considerably more expensive. Hand-held two way radios are another communications option. Don’t forget garage sales, moving sales, and second hand stores for finding items to go in your emergency pack. Always be looking. Keep you list handy. Online places to look are local Facebook groups that list things to sell, Craigslist, and Nextdoor.com. Always check for discount coupons as well. It’s always quicker and easier to buy the pre-made kits for sewing, fishing , and first-aid kits. You’ll typically get higher quality products and a better price by putting your own together. That also makes you more familiar with the contents. All of this gear can get heavy. Ideally, you’ll want your bug out bag, when packed, to weigh no more than about ten percent of your body weight. You can purchase bags already loaded with gear. That’s quick and easy. However, you probably won’t get the best quality and durability. To get started, you can keep your list with you and purchase the items you need a little at a time. Of course, the sooner the better. Bag selection is critical. You want it to fit you well and be comfortable. It must also be extremely durable. If you need to evacuate, chances are good you’ll be able to take your vehicle with you. That’s why it’s wise to keep the gas tank topped off. 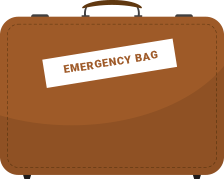 You can either take your go bag with you when you drive, or you can create a totally separate emergency preparedness kit for your car. Either way, you can definitely store larger items in your vehicle, and you should always take a go bag with you when you head out of town. Quick-grab itemsYou’ll also want a few items by your bed for quick-grab-and-go situations. To keep it simple, just make sure you have shoes, a jacket, your glasses, and a flashlight within reach. Practice in the dark to be sure you know exactly where they are and how to get to them quickly. Preparing a longer-term kit for hunkering down at homeWhile the Red Cross recommendations are to be prepared to go at least three days without access to the utilities and conveniences you normally enjoy, it’s possible you could face a disaster that will last longer. You’ll feel better with a 14-day or 30-day supply of food and water. Most families have enough goods on hand to go three days without a grocery store. But what if you needed to sit out a week or more, using only the supplies you have right now? That could be tough. You’d want to first use up the food in your refrigerator, then the food in the freezer (If the power is off, don’t open the door until you’re ready to get food out), then your emergency supplies and the food in the pantry. For more information, see the federal CDC emergency preparedness website. Here are some tips on where to shop and what you’ll need. Canned food is excellent for long-term home storage, but not so great for your go bag. For that, your best bet is freeze-dried food. Check outdoor stores and big box stores like Costco and Sam’s Club for deals on emergency meal packs. You can dehydrate your own emergency supplies. With enough sun, you can do it outdoors, or you can purchase an electric dehydrator fairly inexpensively. Here again, remember to look for deals at garage sales, second hand stores, and online. Getting your emergency preparedness kits together can be a fun family adventure. After you’ve collected what you need, don’t stop. Test your systems. Make sure you know how to use all of your tools. Taste the food. Have a bug out day and go camping.Make it fun! Since 1907, the Scouting movement has relied on “Be Prepared” for its motto. Those two words describe the essence of identifying, monitoring, getting ready for, and facing potentially disastrous events. The Scouts say one should be prepared in both mind and body. We’ll add to that and say one should be prepared with planning and supplies – those help ease the mind and will help protect the body. For more information, we’ve listed resources below. Stay safe. Be prepared.